The memory of it still haunts me to this day. I was 18 years old. Some friends of mine from church convinced me to go to a big youth gathering. I don’t remember who sponsored the gathering, I do remember that most of the Lutheran youth groups in the greater Vancouver area were in attendance and various Lutheran pastors were involved in the leadership. At some point near the beginning of the event we were each given a small nail, divided into groups and asked to line up behind one of the three wooden crosses that were laying in the hall. We were then given our instructions. We were about to hear a dramatic reading of the Gospel According to John’s account of the crucifixion. When the reading was over we would be invited to proceed to the cross nearest us, knell down, take a hammer, and drive our nail into the cross. With each blow upon the nail we were asked to remember our own responsibility for the death of Jesus. We were asked to remember that it was we who had crucified Jesus, for we were the guilty sinners for whom Jesus died. It was a powerful, gut wrenching experience that still haunts me to this day. I wasn’t the only young person who wept buckets that day. I immersed myself into the ritual act as I recounted inwardly the list of my own sins. Together with my friends, we left that hall believing that Jesus died because of us. We left judged, convicted, guilty, tormented, anguished, and full of hope, for we knew that Jesus had died to save us from our sinfulness. Like so many who have gone before us and like so many who will gather on this Good Friday, we left that hall believing that God sent Jesus to die for us; to pay the price for our sin. Like so many Good Friday commemorations, our actions upon that day were a crime against divinity. We judged God to be so vindictive, as to demand a blood sacrifice to pay for our sin. We happily accepted what we judged to be God’s grace; the grace of having sent a saviour to die upon the cross for our sake. We gratefully accepted the notion that God would sacrifice God’s only Son to satisfy some sort of cosmic justice; to pay the debt we owed on account of our sinfulness. If I could, I would return to that hall and remove my nail from the cross, not because I believe that I now know better, but because on that day all those years ago I participated in a crime against divinity. Christians have been doing it for centuries. Over and over again we gather to remember the events surrounding the crucifixion of Jesus of Nazareth, and over and over again much of what we do convicts the Creator of all that is and ever shall be as some sort of petty, vindictive judge who could only be placated by the blood of his own beloved child. So much of what is done or will be done on Good Friday is a crime against divinity. It’s long past time for the church to stop casting our God in such a petty and small way. It’s long past time for us to use our Good Friday rituals and commemorations not to re-enact the crucifixion so that we can cast God as a cosmic judge, but rather to see the crucifixion for what it was and is. The crucifixion of Jesus of Nazareth was not a unique event in the history of humanity. It wasn’t even a unique event in the history of Rome. Crucifixions happen every day. Every day innocent people are humiliated and every day people die abused and shamed. Every day there is unnecessary suffering. Over and over again groups, villages, cities, nations, corporations, and races, band together and select scapegoats upon whom they heap their fears, anger and frustrations. Jesus was not the first and he won’t be the last to feel the pain of abandonment, and cry out: “My God, my God, why have you forsaken me?” Each one of us in our own way have experienced the pain of losses so deep that we have felt cut off, isolated, desperate and along. We have all know the desperation that comes when we feel that there is no way out, that everything is finished, that our life is about to end and we have each of us cried out to God claiming that we have been abandoned or begging not to be forsaken. The crucifixion is important because it is always happening. The crucifixion is not important because of its ramifications for our individual salvation. The crucifixion is important because of what it tell us about our humanity. If what theologian Marcus Borg tells us about the importance of the stories that have been handed down to us is true, then what’s really important about the historicity of the crucifixion accounts is not whether or not the details chronicle actual events but why they told the stories they way they told them. It’s not the what and how details that are important in and of themselves, but rather the why. Why did they include particular details, why did they tell the stories the way they told them? What were they trying to tell us? If someone asked me today to design a ritual for young people so that they could gain some understanding of the crucifixion. I would not have them a nail and invite them to drive it into a cross. I think perhaps I would give them a piece of cloth and invite them to tear it into. One by one, I would as them to do it one by one and to the sound of cloth tearing I would ask them to focus not on the moment of Jesus’ agonizing death, but on what the chroniclers of the crucifixion tell us happened immediately after Jesus death. The temple curtain, which stood between the people and the most holy part of the temple, tears in two. Suddenly, the separation between the people and God is gone. The earthly and the heavenly are one. God and creation are one. What has been separated comes back together. Jesus was not crucified because God sent him to die because someone had to pay the price for our sin. We are not a fallen people. We were not born sinful. The chroniclers of the crucifixion knew nothing of the doctrine of original sin. There is no debt to be paid; no blood sacrifice needs to be extracted. We are an evolving humanity. Born out of the stuff of creation, ever changing, ever evolving. There is no perfect creature back there in the mists of time, who fell from grace. We’re not trying to make our way back to the garden. Humanity is imperfect, struggling to learn from our past, striving to be better; making mistakes along the way, capable of great things, for we are wonderfully and beautifully made and yes we are capable of great destruction, and longing to learn to live in peace. This amazing evolving humanity living within this astounding creation, lives and breathes in, with and through the Creator of all that is and all that ever shall be. God is the one in whom we have our being. But sometimes we forget that, or the pain of this evolution makes it difficult for us to see that we are one with God. Jesus tried to remind the people of his own time and place that they too were capable of great things. Jesus reminded the people of Israel that not even the mighty powers of Rome could destroy their dream of union with God. Jesus taught them that the dream of God’s reign of peace through justice would be realized when they learned to love one another. Jesus embodied the kind of love that fosters human evolution. The love of Jesus threatened the powers that be. As people began to listen to Jesus they began to question the status quo, and the Roman Empire’s carefully built system of oppression relied on the maintenance of the status quo in order to keep the people in their place. But Jesus kept on and on about love and justice and equality and peace, and the people began to dream of a better way. So the powers that be did what oppressors do, they shamed and humiliated Jesus and when he refused to submit they executed him. Jesus was not crucified because God needed someone to pay. 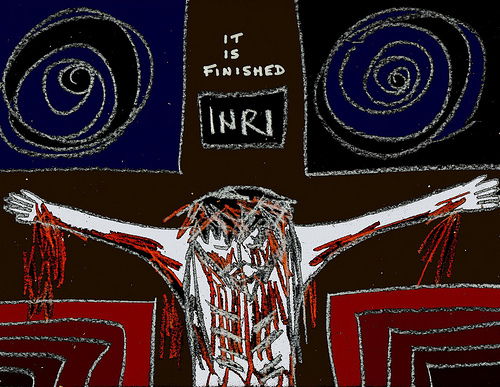 The crucifixion is what happens when we become separated or alienated from our radical interdependence. Crucifixions happen when we forget that we are one: one with God and one with each other. We share a common humanity and our Creator is an intimate part of who we are. The crucifixion didn’t cleanse us of our sin, it wasn’t what God needed to forgive us. Crucifixion is what happens when humanity goes astray and we try to control each other. Crucifixion is what happens when we separate our selves from the one in whom we live and move and have our being. The crucifixion happens over and over again when we are lost in our incompleteness, our brokenness, our alienation, lost from the truth that we are one. The Crucifixion is what happens when some people are given more worth than others, when we turn our backs on the inherent worth and dignity of all living things, when we by pass justice, equity, equality and compassion and try to live off the energy generated by anger, fear and hostility. When the ties that bind us to each other are cut and we are alone, that is crucifixion. And still, and here is the paradox of Good Friday, sometimes it is in the brokenness and alienation and loss that we come closest to the sacred, when we see most clearly what it is that really matters and what our individual spirits and the spirit of humanity are yearning for. Sometimes in our suffering the curtain is torn and we see those larger truths that have eluded us. At the sound of the tear, we begin to hear the barrier that separates fall away long enough for us to hear and know what we are called to do in order to move us back into the web of interdependence that makes us one. After the horror of crucifixion the curtain is torn. As the curtain between who we are and who we can be is ripped down, we begin catch a glimmer of all that we were created to be. We weep at the realization that Jesus is crying out to all those in whom the Spirit of God lives and breaths. We weep not just for Jesus, but for all the unjust, unnecessary, and untimely deaths that still go on in this world. We weep for the thousands of children in who will die this very week of starvation, and for the infants who are born into poverty or abuse. We weep for the children who grow up in war torn lands, collecting mortar shells like some kids collect baseball cards, and for those children of our own cities who have been victims of random violence. We weep for young people in this community who will never be safe in their own homes and for those who do not have a home to go to. We weep for that young woman who would rather die than suffer any more sexual abuse, and we weep for that young gay man who took his own life when those he loved the most couldn’t accept him for who he is. We weep for those we love who have died and for those who we have lost because of anger or misunderstanding. We weep knowing that the crucifixion did not happen once and for all, way back when. But we do not weep without hope. For we know what lies beyond the cross. We can hear the sound of the curtain that divides us one from another is torn into. As the cloth tears and we remember who we are and whose we are, we know that: Jesus’ LOVE could not be destroyed, not even by the thing we fear the most, death itself. Death could not put an end to love. The love that Jesus’ embodied lives on in with and through the followers of Jesus down through the ages. The reality that Jesus’ love lives on, reminds us of the power of love to unite us, to mold us and shape us; to propel our evolution toward a more perfect humanity. Jesus has shown us the way and we can live the abundant life that Jesus was so passionate about. We can live lives that are free from the fear of death. Jesus taught us that life without fear frees us from the powers of darkness that enslave the world. Life without fear is the first step toward justice. And justice and not violence is the way to peace. The early Christians stood out in the world for a reason. The Way that Jesus taught them was the path to peace through justice. Jesus calls us to usher in God’s reign of peace in the world by seeking justice for all of God’s creation. For justice and not violence is the way to peace. Jesus was so passionate about his belief that living life abundantly, without fear would lead to justice that in turn would lead to peace on earth, that he was willing to live his life as the embodiment of the LOVE of God. Jesus died not for our sins, but to show us the way to be the embodiment of the Love that is God . The powers of darkness will have their day. But the cries of the crucified will not go unheeded. Christ will come again and again. Christ is embodied in all those who work for peace through justice, grace and love. Let the sound of the curtain being torn remind us that the barriers that we erect will not stand; for we are one, one with God and one with each other. Ultimately, nothing can separate us from wholeness, for in God we live and move and have our being. Now and always, Amen. This entry was posted in HOLY CROSS LUTHERAN, PONDERING PASTOR, Progressive Theology, SERMONS and tagged emergent theology, emerging church, evolutionary christianity, Good Friday deny atonement, Good Friday Lutheran Sermon, Good Friday progressive Christian sermon, Good Friday Sermon, Jesus did not die for our sins, John Dominic Crossan, John Shelby Spong, Marcus Borg, progressive christianity, progressive theology, spirituality, theology, three wooden crosses by Rev. Dawn Hutchings. Bookmark the permalink. I couldn’t have said it better myself, we get it all wrong, we focus on the wrong items, William Coffin said “we get just enough religion to make us miserable”, here here. The progression of the Bible is a relatively new concept to me , its not God who changes, but our understanding of God. That original sin stuff is pure nonsense, our cultures\ religions over the century’s has done us such a disservice. People think they are bad, God cannot be happy with them? Its such a shame, we are called to be happy, loved, whole , interconnected beings, and we get caught up with crap.